My Samantha Bryan inspired Bumbling B. A few years ago I came across these great little craft figures in one of my wife's craft magazines. 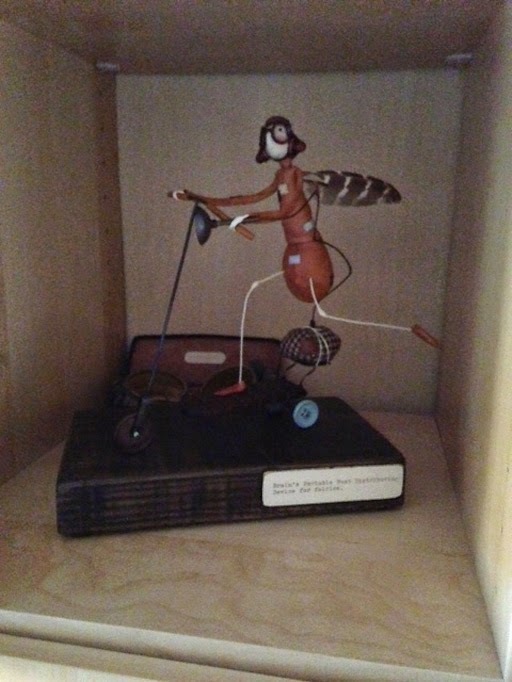 The creator, Samantha Bryan produced these strange little fairy creatures from who knew what material and imbued them with their own character and names that hinted at the story that I'd like to hear. For our 50th birthday presents to each other my wife and I bought our own pieces at a gallery in Birmingham. Mine is on a little scooter and I'd often marvel at his construction and wonder 'What was his head made out of ? 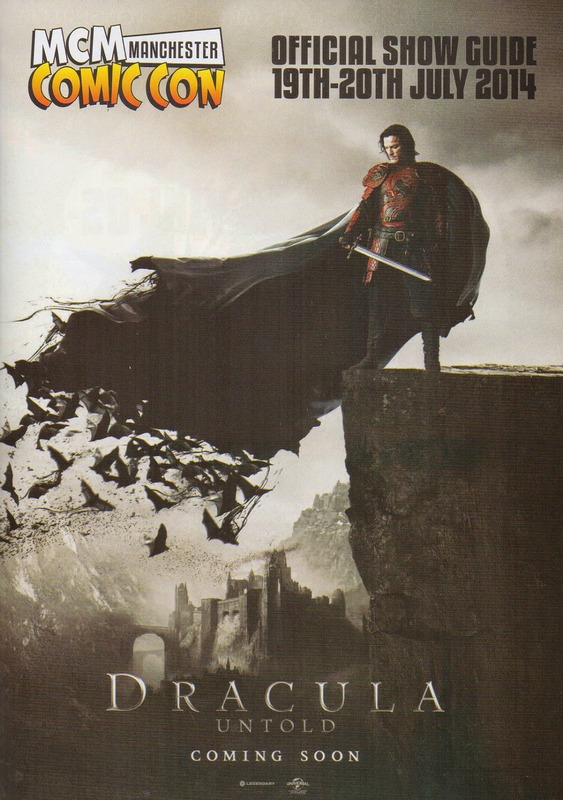 His suit was leather but how had it all be stitched around the wire frame ?'. 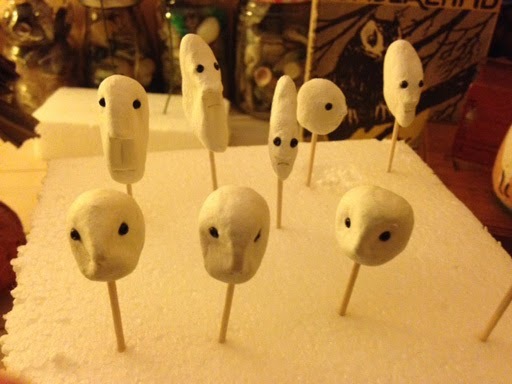 As a fan of craft artwork, I often visit a local artist studio and gallery called Unit Twelve, and at one visit early in the year I found that Samantha Bryan was to be running some workshops, where she would teach people how to make their own little figures. I was in. I booked two places, taking my wife along as she's far better with materials and stitching than I'll ever be. And I got to work designing what I'd want to make. I decided on a figure from my upcoming little From SuperZeroes to SuperHeroes book. 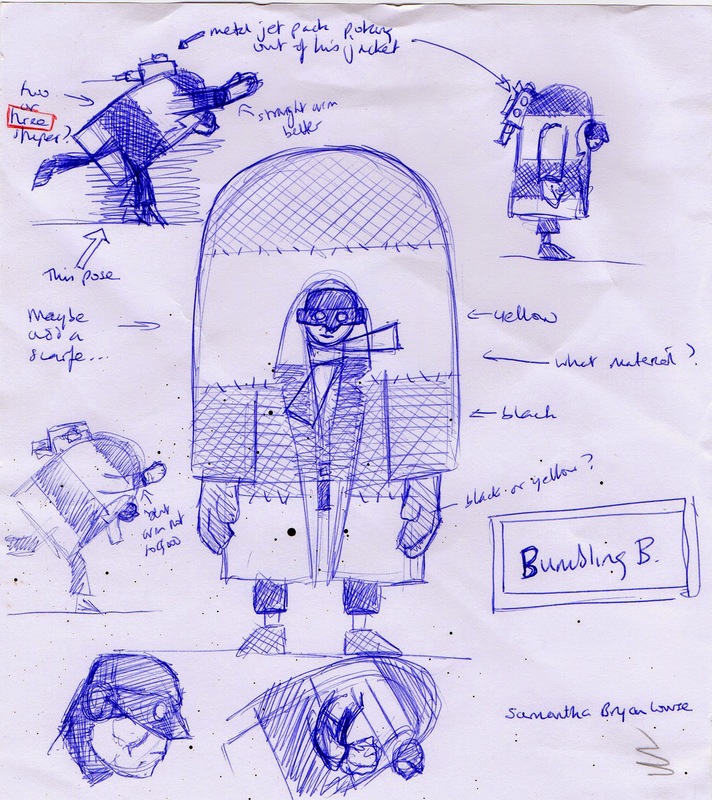 A character from the A to Z of SuperZeroes called The Bumbling B.
I didn't notice any strange looks Jane, my wife, may have cast in my direction and never for a moment doubted that I could make this little chap. And then the 11th of May duly arrived and I found myself sat a a table facing Sam (as she prefers to be called) and she started to tell us how we could make our own fairies. Sam was quick to notice a few glances that Jane sent in my direction and asked what was wrong. Jane told her that I'd come up with my own design, and despite me saying that I'd happily create a fairy, Sam's interest was piqued and she asked to see the sketch when she'd finished explaining how we go about making the heads. Sam took to the idea straight away and we agreed to have a go. So as she set off looking for a tube we could use for the body, I got to work on his head. Bumbling B was to be the first on the left in the back row. The idea is to make a few heads in the hope that one of them is usable. The day passed with me looking at those around me progressing really well with their little fairy people whilst I didn't actually get as far as even sewing his trousers on. I promised Sam that I would finish him though and left not feeling despondent but feeling challenged. for the dome at the top in particular. I was lucky to have Jane around, as she could visualise the patterns that I needed to cut and stitch together for the more tricky pieces, like his coat. But piece by piece, day by day, he started to come together. A box of bits of something in the making. And eventually the box of bits looked less like a box of random bits of leather and wire and more like a figure of some description. The bits actually starting to look like something in the making. Now as the body was progressing I was also working on the head. Would anyone like to play hangman ? as worn by all true super-heroes but at first he looked more like a Hangman. So I decided to add some goggles as they're cool, and my daughter Jemma, who by now was beginning to believe that I might actually finish the little guy, suggested antennae. and a pair of goggles make all the difference. And his head was complete. If I'm honest, it was about this time that I also thought I might actually finish this little chap off, and decided I'd better turn my attention to his Jet-Pack. I'm always picking up bits and bobs at antique fairs or shops and when I saw this old (but not too old) fishing reel I knew it'd be perfect. holes showing that there was nothing inside. It'd have to have a dark wash on it to tone it down a bit. It'd need something inside though. ...and a dark wash to tone it all down and his Jet-Pack was complete. Just needs some wire mesh on that hole. Which just left the body to complete, and the feet, oh, and the hands. I decided to mount him on a big block of wood, the idea being that if I put him on the table at Comic Conventions he wouldn't keep falling over, and made a little pair of leather boots. Drilling a hole and pushing the wire in made him very stable. I'd need to push him down so that the wire under his foot wasn't visible, and that would only leave his gloves to make and the small matter of fitting his Jet-Pack such that it looked like there was more of it under his jacket. Almost ready for lift off. but I was really happy with how he came out. It was fun to put the pencils away, to leave the computer switched off and to pick up scissors, leather and a thick needle. Sewing leather is much more painful than drawing and there's a world of different skill needed to turn a three dimensional shape into two dimensional pattern and then us this to make the three dimensional shape you wanted, but it was always achievable, after a few false starts. Yes, and in fact I'm already drawing the designs for the next one. ... can be found over on www.geeksyndicate.co.uk. 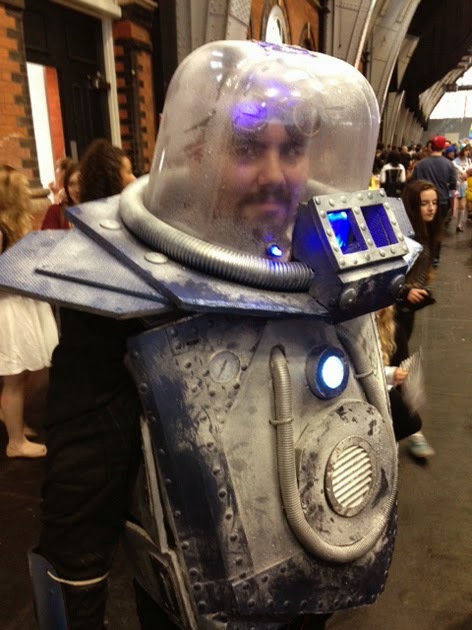 Manchester MCM ... a WonderCon. Well I thought I'd do this report a little differently. Colin has written his usual very thorough report over on his blog, which talks about how well we did as well as all the people we met and chatted with, so I thought I'd make this a more personal report than my normal effort and talk about those things that I loved about this show. 1 -The Accent UK table. Seeing the Accent UK table laid out all neat and tidy with our wide variety of books proudly displayed for all to see. Colin and me ... ready for two days of comics. 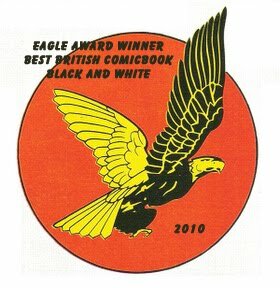 Over the last 10 years or so, yes it's been that long, Colin and I have been involved in the creation of a good number of comic books and have worked with a number of very talented people. Some professional, some amateur, some confident, some doubting their abilities, some fresh from college and some looking for something outside of their careers. They all have one thing in common, they have all been chosen to be in our books, be it as writer, artist, letterer or designer and they all have talent (whether they see it in themselves or not). And the results of their, and our, efforts always make me smile with pride. 2 - Seeing all those creative costumes. I'm a fan of the home made outfits that some of the people wear to these events. Obviously created over many hours, you can just see and feel the passion for the costume in the way it is worn, each person also play acting the character they've chosen. Is it hot out there ? My favourite at this Con was this one. I presume it's Mr. Freeze, and it looked completely hand made, right down to the fans inside that stopped the wearer from expiring due to the heat trapped in the helmet. Wonderful. ... well, he seemed happy enough to strike a pose, Infinity Gauntlet and all. Nothing makes me happier than someone returning to our stall to pick up more of our books, having read one or some of them already at a previous Convention. We had a number of people who stopped to pick up later issues of WesterNoir and one lady, having bought Strange Times and Robot Shorts on the Saturday, returned on Sunday to pick up anything else I had similar work in. I pointed out the anthology titles and she picked them all up. You can't get better feedback than that, and it's that sort of feedback that makes it all worthwhile. The row of tables next to ours. 4. Meeting co-creators and comic friends. It's the only time you tend to see your comic creating friends. Steve Tanner was at his stall (Timebomb Comics) for the entire weekend, but we managed to have tea with him Saturday night, and catch up on future projects. I'm fortunate in that I meet up with co-creator/co-writer and artist on WesterNoir Gary Crutchley fairly often as he doesn't live too far from me, but it's great to have him helping behind the stall. He's very passionate about our books and it's also great for him to see the way that people are responding to his work. His sketches certainly tempted a good number of people to buy all 4 issues of WesterNoir. Gary and me enjoying interest in WesterNoir. You can read Gary's report on his blog. 6. Seeing old work friends again. A good friend, Claire, from my days at Co-op IT popped in on Sunday with her eldest daughter Izzy, her sister Tamsyn and her nephew Lukas. They wanted to see what this MCM thing was all about. It was great seeing the kids discovering MCM Madness for the first time. They seemed to have a great time and I know that Claire was amazed by it all. 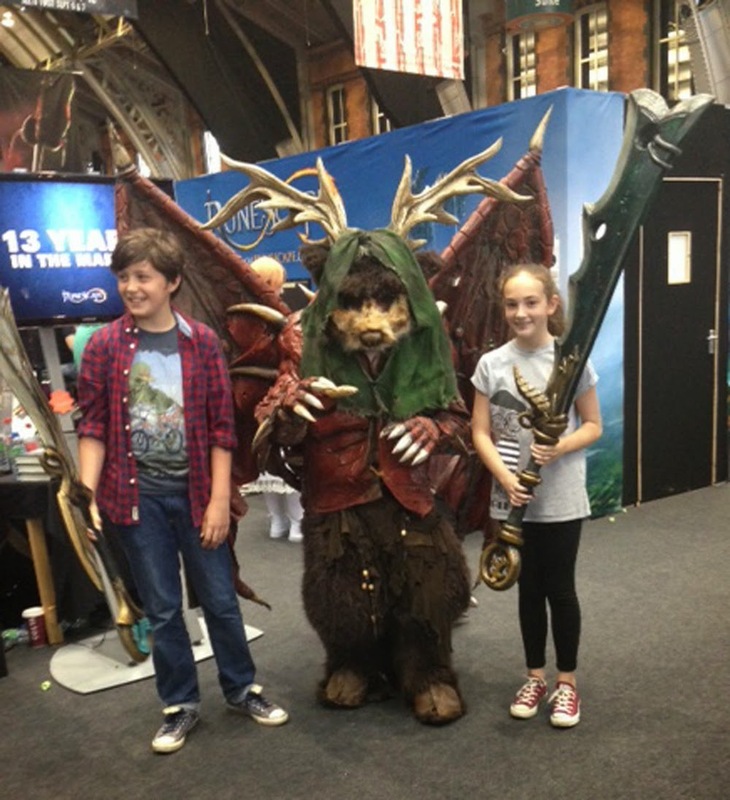 Lukas, strange furry creature with antlers and wings and Izzy. 7. See the Accent UK table at the end of the show. It's always great to see that some of the titles have sold out (we can only bring so many to a show) and even better when we realise that we are taking far fewer boxes of comics home than we arrived with. All that was left after two great days of comics. 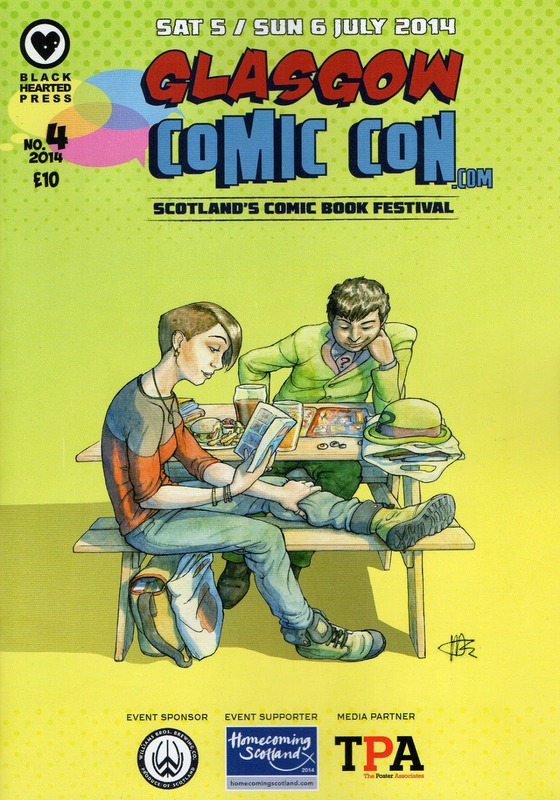 Glasgow Comic Con... a great weekend. 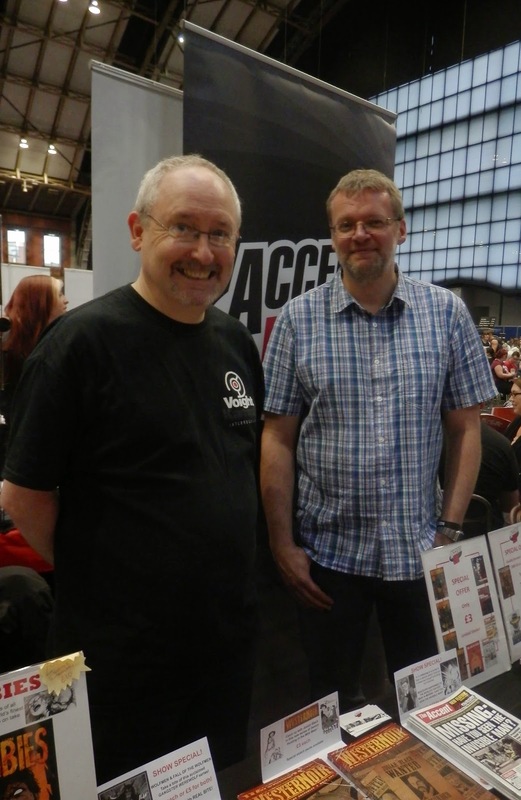 Last weekend saw Accent UK making their way to Glasgow for our very first attendance at the Glasgow Comic Convention, organised by local independent comic publisher Black Hearted Press. We've been to an MCM event in Glasgow and had a great time at that, selling what was then a record number of comic books, and as the numbers at the Glasgow Comic Con couldn't hope to match those of an MCM event, we set our expectations lower. Set in one of the buildings that make up the Centre For Contemporary Arts we found ourselves in a great position at the bottom of the stairs that people had to take if they were going to see more of the event, which was split over a number of levels and buildings. We set up about an hour before doors opened and were expecting the typical slow start but found ourselves selling to people almost from the time that outset. Of course there were plenty of quiet times, and the show had a number of talks and events scattered throughout the day, but on the whole it did feel as busy as the MCM events, I think due to the fact that at this event everybody walking around was looking to buy comics and talk to comic creators. It was great to catch up with John Reppion and Leah Moore, who we haven't had time to talk to for a very long time. We even chatted over a beer which was nice. I was surprised to see that Accent UK were attending a Portfolio Review session in the afternoon and I found myself sat at a table talking to people about their artwork. And pretty impressive it was too, with a whole range of styles and subject matter. What did strike me in general though was that a lot of the artists were keen to demonstrate their versatility, at the expense (in my opinion) of developing their own distinctive style. At the end of the day we found to our surprise that we'd done very well and that the show was already a success from our perspective. That night, after having tea with the families, Colin and I attending a Convention Event, beers and burgers but had the posher title of 'Cocktail & Burger', but we settled for just the beer as we'd already filled up on pizza. We spent and enjoyable evening meeting new creators and catching up with Owen Johnson, who appears to be pretty busy these days with two new books out. The Sunday was pretty similar to the Saturday really in that we were pretty busy. We sold a good number of books, people came back to pick up more books having read and enjoyed what they'd bought the day before and we spent the day talking comics and enjoying ourselves. As the event closed we found that we had sold out of some of the titles we'd taken, sold a good number of our new WesterNoir ongoing series and also a good number of our Wolfmen books.